"A must have van life essential"
The van life is beyond incredible, unlimited freedom, incredible views, incredible people and very little showers… wait, what? That’s right, we all know that your average camper conversion lacks one of the main necessities of a normal home, and that’s a shower. Showers take up lots of room, requires a lot of water, and if you want a hot shower, that’s a whole other problem. Vandwellers do it, there has been lots of great work arounds, but for your average weekend warrior there needs to be a reliable and affordable solution. That’s why we’ve been testing the Rinsekit Portable Shower, an affordable portable shower build for van lifers, adventurers and campers. Is it what we’re looking for? Does it work? Read on, and we’ll tell you all about it. Join our van lifers & weekend warriors community on Facebook to learn new things and meet new people on the road! The Rinsekit is a fairly large item for your camper, but it will soon become one of your mandatory van life essentials. It’s built with a durable plastic that can take plenty of bumps and bruises, it’s fell out of our camper a couple of times and it looks as if it’s brand new still. On top you have a large blue handle that allows you to store, and move your Rinsekit with ease. When the Rinsekit is full with 2 gallons (14 litres) of water it will weigh around 24lbs (10kg) and when empty 9lbs (4kg). 14 litres is a lot of water, this can give you a steady pressurised shower for up to 6 minutes! 6 minutes is a long time for one person, but it’s the perfect amount for a couple or if you’ve got a lot of gear to clean such as surfboard, your camper or even the dishes too! When the Rinsekit is filled with water you can then use a number of different attachments, it comes with a normal triggered shower head but if you want to be a bit more adventurous you can buy a tonne of accessories for it. 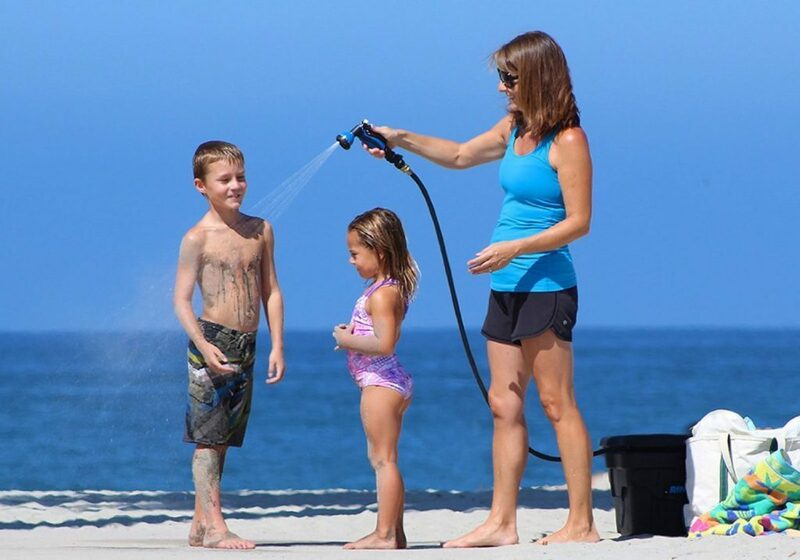 One accessory that sounds very interesting which we haven’t tested is the heated Hot Rod Water Heater, this is an electric rod that is placed in the water, and will actually heat your cold water while you’re driving. It’s a great way to prep yourself for a hot shower on the go. And this can also be used if you don’t have access to hot water to attach via sink or spigot, what we’d also like to see is a way to connect that rod to solar panels, or even external solar panels that you just chuck in the sun when you’re parked up. With a full Rinsekit as mentioned, the shower can be used for up to 6 minutes, and take our word for it, it’s not just a drizzle, this is a strong flow of water here, allowing you to actually shower and clean yourself comfortably. This is the feature that we were most hesitant about talking about but we were secretly blown away with how the pressure system works in this Rinsekit. No pumps, no batteries, the pressure is caused by the attached spigot that you attach the hose too, the Rinsekit does all the pressurising work for you. It’s magic. 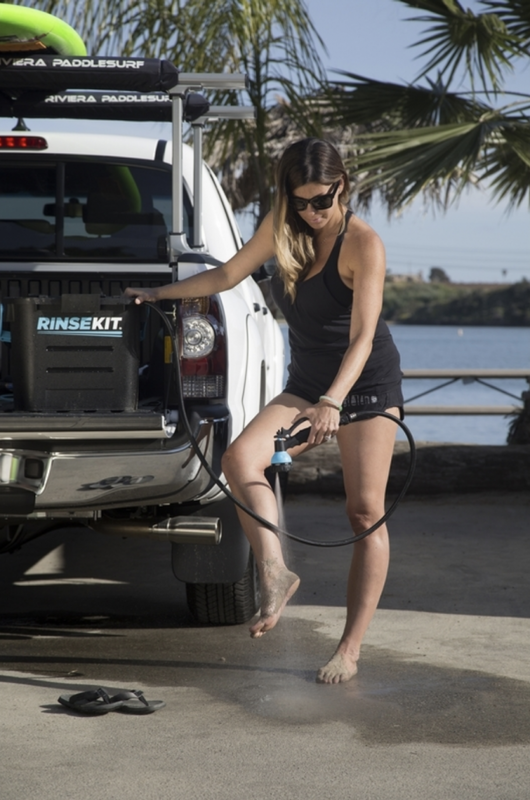 Another feature we quite like is that the water hose can actually be stored of the Rinsekit, they’ve left a small section inside to store this, meaning you’ll never have an annoying hose just swinging around getting in the way when you’re on the road. Overall, this has become one of our main van life essentials, and we recommend this to any weekend warrior or van lifer who is always on the road and needs a warm shower inside of their ride, but lack the space to feature a real one. This Rinsekit fits perfectly for our lifestyle and fixes a major problem for many of us with these adventurous lifestyles. We’re impressed. And you will be too if you pick one up. 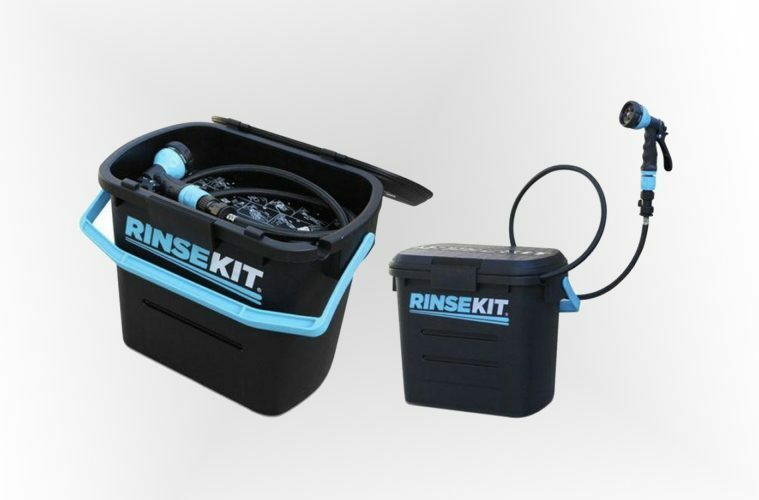 Just make sure to save some pennies as the Rinsekit starts at $100, a bit pricey for our liking, and would be much happier seeing this around the $70 mark, but without a doubt a superb product, and we wish we had one earlier!